A royal commission in 1987 investigated Aboriginal deaths in custody over a 10-year period, giving over 330 recommendations. Its recommendations are still valid today, but very few have been implemented. Every year, Aboriginal people continue to die in custody. Percentage of Aboriginal people in the population of Australia. In 1987 the government led by Bob Hawke decided something must be done about a rising number of complaints that Aboriginal people were dying in suspicious circumstances in police cells. It announced a Royal Commission (a major government public inquiry into an issue) into Aboriginal deaths in custody on 10 August 1987 in response to a growing public concern that such deaths were too common and poorly explained. Hearings began in 1988. The commission initially set out to examine 44 specific cases but that eventually grew to 99, with 32 in Western Australia, 27 in Queensland, 21 in South Australia and the Northern Territory and 19 across NSW, Victoria and Tasmania . The Commission submitted its final report in April 1991. All up, the commission cost about $40 million, with another $400 million spent on implement of its recommendations . To monitor deaths in custody, the Australian Institute of Criminology established a national deaths in custody program which should publish an annual report. A decade ago, the program was delivering its reports within days of the close of the reporting period - the 2003, 2004 and 2005 reports were delivered within one month. Then, without explanation, each of the next 3 reports took between 16 months and 2 years to appear. The 2009-11 report has been almost 3½ years in the making . The Royal Commission examined the deaths of 99 people who had died in custody between 1 January 1980 and 31 May 1989. It looked into both the causes of the deaths and the prevention of future deaths and tried to answer the question: Why are so many Indigenous people in custody? Why were they treated that way? 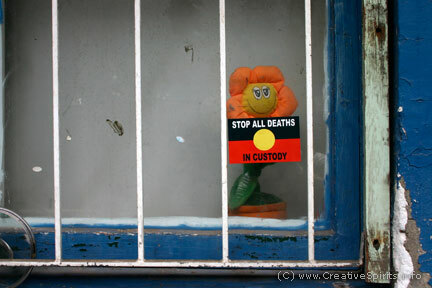 Aboriginal people do not die at a higher rate than non-Aboriginal people in custody. The rate at which Aboriginal people are taken into custody is overwhelmingly different. Investigating the deaths in NSW, Victoria and Tasmania the commission found that 13 of the 18 deaths in custody may have remained alive had custodial authorities not been negligent, uncaring or had followed procedures adequately. The other 5 deaths might also have been avoidable on the grounds that these people may not have needed to be in custody at all . 87. Arrest people only when no other way exists for dealing with a problem. 161. Police and prison officers should seek medical attention immediately if any doubt arises as to a detainee's condition. 339. Initiate a formal process of reconciliation between Aboriginal people and the wider community. The last recommendation led to the establishment of the Council for Aboriginal Reconciliation. The National Archives of Australia have a list of names of persons who died between 1980 and 1989 and whose deaths were investigated by the Royal Commission. Guardian Australia, in its Deaths Inside project, created a list of every known Aboriginal death in custody in Australia from 2008 to 2018. Filters allow a very detailed investigation of the data. 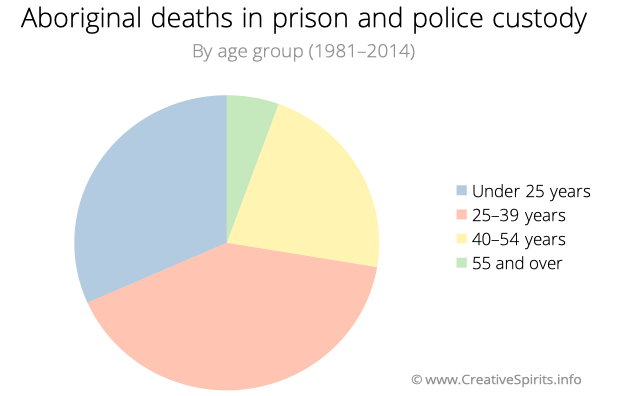 Few deaths in custody are forgotten. 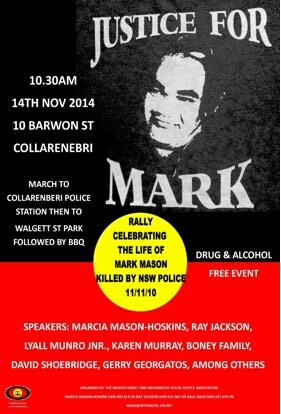 This leaflet advertises the 4th anniversary of the killing of Mark Mason by NSW police at Collarenebri on the 11th of November, 2010. Mark was shot by five police officers who were attempting to arrest him . At the time of the commission's final report in 1991, Aboriginal people were 8 times more likely to be imprisoned than non-Aboriginal people. A decade after the report was handed down they were 10 times more likely to be imprisoned. In the 2010s, they were 15 times more likely. In Western Australia, which has the highest Aboriginal imprisonment rate in the country, Aboriginal people are close to 20 times more likely to be jailed than non-Aboriginal people . Between 2003 and 2013, the Aboriginal rate of incarceration has soared 11 times faster than the non-Aboriginal rate. Prison rates for Aboriginal women have increased by a third between 2002 and 2007, and the number of Aboriginal men by one-fifth , while police custodial rates remain as high as before. In 2009, the proportion of Aboriginal prisoners had almost doubled in the 20 years since the commission delivered its recommendations . 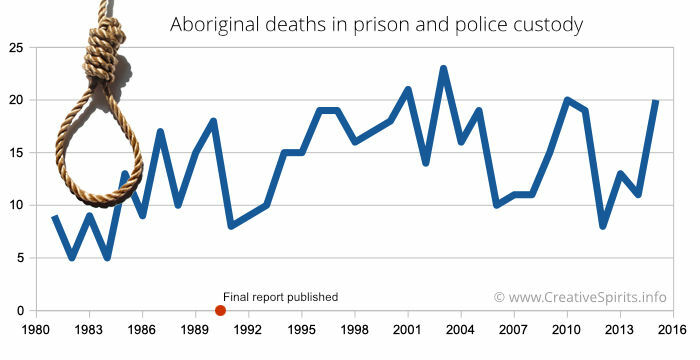 In 2013, the Australian Institute of Criminology (AIC) found Aboriginal deaths in prisons had spiked over the 5 preceding years, despite deaths in custody for non-Aboriginal prisoners remaining stable. It found most deaths were caused by heart conditions and other medical problems, though self-harm remained high . Community impact: "Families are destroyed by this cruelty"
When family members go to prison, families and communities are affected by the loss of parents, role models, childcare and family income. The Indigenous Social Justice Association is fighting since many years for the rights of families whose loved ones died in police custody. These high prison rates come to no surprise. Equally, every state and territory claimed that the principle of imprisonment as a last resort had been, or was in the process of, being implemented, but this wasn't entirely so. A survey of the Australian Indigenous Law Review in 2009 showed that Australia's states still had only acted on a fraction of the commission's recommendations. Victoria had acted on 27%, NSW on 48%, Tasmania on 41%, South Australia 52% and Western Australia 50%. Besides the Australian Capital Territory, the Northern Territory was the most adherent to recommendations because mandatory reporting is in place in the NT . Worse, the Northern Territory government in 2014 introduced 'paperless arrest' laws, which allows officers to jail a person with no warrant and no charge for 4 hours. "An arrested Aboriginal person has to run the gauntlet of first being in police custody then being placed in custodial transport, then being incarcerated in a prison," explains Aboriginal elder and leader of the Euahlayi tribe, Michael Anderson . "At each stage we now have records that indicate that all three stages have increased their statistics of Aboriginal deaths since the Royal Commission into Aboriginal Deaths in Custody." When using the statistics, it is important that Aboriginal deaths are placed in the context of the number of people in prison. "At the heart of the problem is the over-representation of indigenous persons at every stage of the criminal justice system," concluded a report by the Australian Institute of Criminology in 2013 . Aboriginal prisoners also die at younger ages from natural causes , reflecting the poorer health conditions and lower life expectancy of Aboriginal people. Clear message. I found this sticker on a residential window in The Block, an area of Sydney's Redfern where mainly Aboriginal people live. Why do you think there are so many Aboriginal deaths in custody? To answer this question, examine the relationship between Aboriginal people and police and why they get arrested and put into prison. Which health issues contribute to the high rate? Compare your findings with experiences of non-Aboriginal people. Aboriginal deaths in custody happened before the commission was formed and still happen today. THe death of Lloyd Boney, found hanging in a police cell in Brewarrina, NSW, in August 1987 is regarded as the catalyst for the royal commission . The deaths of John Pat and Eddie Murray are two more examples. One of the more recent cases is the death of Doomadgee Mulrunji in 2004 after a senior police officer 'fell' on him. John Pat was just 16 years old when he got involved in a fight outside the Victoria Hotel in September 1983 in Roebourne, northern Western Australia. Off-duty police allegedly had assaulted Aboriginal people who in turn fought back, sparking the brawl. According to witnesses, John Pat was struck in the face by a policeman and fell backward, striking his head hard on the roadway. One of the off-duty police went over to Pat and kicked him in the head. Pat was then allegedly dragged to a waiting police van, kicked in the face, and thrown in 'like a dead kangaroo' . He and other Aboriginal people were driven to Roebourne police station. While some of the assaulted Aboriginal people spent up to a week in hospital recovering from the injuries inflicted on them by police, John Pat died a little over an hour after he was locked up. A subsequent autopsy revealed a fractured skull, haemorrhage and swelling as well as bruising and tearing, of the brain. Pat had sustained a number of massive blows to the head. One bruise at the back of his head was the size of the palm of one's hand. Police seem to respond more vigorously to public drunkenness by Aboriginal people than to domestic violence in white society. In 1983 Roebourne had eight officers and two police aides while the nearby 'white' town of Wickham had half as many police for twice the population . In court an all-white jury heard the five police officers denying the acts of violence they were accused of, and that any actions on their part were done in 'self-defence' despite evidence of blood on police officer's boots. On the same day the jury found all police not guilty. No charges were ever laid. Charges were laid against some of the Aboriginal people, and they were subsequently fined for assault, resisting arrest or hindering police. 30 years later, in September 2013, the West Australian State Parliament formally apologised to the family of John Pat for his death. The death in custody of John Pat bears great parallels to the case of Mulrunji Doomadgee on Palm Island in 2004 who died hours after he had been put in prison for public drunkenness. 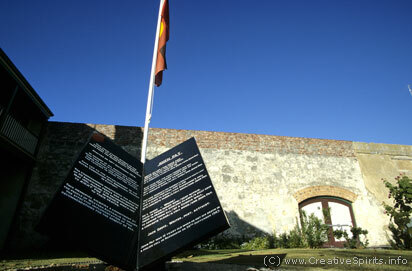 Memorial for John Pat in front of the prison walls of the decommissioned Fremantle Prison. It was erected in September 1994 "in memory of all Aboriginal people who have died in custody in Australia. The poet Jack Davis contributed a poem which is inscribed on the right hand side of the memorial (see also below). 'Guddia' is a Kimberley (north Australian) term for the white man. The poem was also published in Jack Davis' book 'John Pat and Other Poems'. Each year on September 28, John Pat Day, people hold memorial services or march in protest. Eddie Murray was 21 when he was last arrested. On June 21, 1981 he was drinking under a tree with his cousin and some friends. He was arrested at 1.45am, taken to Wee Waa police station (about 400 kms north-east of Sydney), and held under the Intoxicated Persons Act. Within an hour he was dead, and his family have consistently attempted to find the cause of his death. At the inquest the police claimed he had killed himself by hanging, even though they agreed under cross examination that he was "so drunk he couldn't scratch himself". Yet according to them, Eddie had managed to tear a strip off a thick prison blanket, deftly fold it, thread it through the bars of the window, tie two knots, fashion a noose and hang himself without his feet leaving the ground. Later the police were found to have lied under oath. The coroner ruled that Eddie had died "at the hands of person or persons unknown" and strongly criticised the police. No-one was charged with Eddie's murder, a fact that left his parents Arthur and Leila deeply unsatisfied. 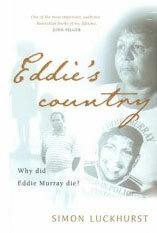 The Murrays initiated an exhumation of Eddie's remains in 1997 which revealed injuries undisclosed at the original post mortem and during the Royal Commission, and in 2000 the matter was referred to the NSW Police Integrity Commission for further investigation. On the night of 25 January 2008 Mr Ward was arrested for a traffic offence in Laverton, about 900km north-east of Perth . A Justice of the Peace refused him bail so that the next day he was to be transported to Kalgoorlie, 360km south, for a scheduled court appearance the following week. He was placed in the steel cell of an aging prison van in 42-degree heat and only given a 600ml bottle of water. The two prison officers driving the van did not make any comfort breaks or checks on Mr Ward. It wasn't until they heard a thump that they stopped and checked, discovering Mr Ward had collapsed in the back of the van. He was taken to Kalgoorlie hospital but all efforts to revive him failed. He had died of heatstroke. "The doctor who opened the door of the van to extract Mr Ward told the inquest that it felt like a blast from a furnace as the air escaped from the tiny steel cell pod." Evidence indicated that Aboriginal Elder Mr Ward had suffered third degree burns to his upper torso after falling onto the hot surface of the steel cell. The department had been warned many times that the vehicles used to transport prisoners in remote regions were "a grave danger" to any prisoner. More than two years later the Director of Public Prosecutions decided not to lay charges against the two security guards , noting that he could not determine if they had colluded when giving evidence. On July 29, 2010 the family of Mr Ward received one of the largest ex-gratia payments ever made in Australia when the West Australian goverment approved $3.2 million, recognising a "terrible wrong" . The money only covers lost wages of Mr Ward and does not compensate for his inhumane treatment. Both the Department of Corrective Services and the prisoner transport company G4S pleaded guilty . However, no-one has been charged with any offence in relation to, and there will be no prosecutions resulting from, Mr Ward's death . The Deaths in Custody Watch Committee in Western Australia was set up by a coalition of concerned parties in 1993. Its specific aim is to monitor and work to ensure the effective implementation of the Royal Commission Into Aboriginal Deaths In Custody. The AIC is the government department that supplies the Australian Bureau of Statistics with its data about deaths in custody. To get the government-flavoured perspective, read its very detailed article Deaths in prison custody which, among many other statistics, also lists Aboriginal deaths in custody by state or territory. What would be a likely answer to the two questions Commissioner Wootten mentions? Why do you think the Commission investigated the wrong question? Is the "real question" still relevant today? Why or why not? Mr Ward's first name cannot be named for cultural reasons.